The summer of 2012 is and continues to be remembered for the constant rainfall. June was already recognised as the wettest since records began. I guess as a resident Englishman one shouldn’t be surprised by a month of rain drenched weekends, which is tolerable I guess, but April, May, June and July have barely offered up a few good days for walking. The SMASH diary had in mind the high peaks to be tackled in what should be the drier of months; clear blue skies, long days, sunset desents. We had already postponed our ascent on Skiddaw scheduled for early July, remains un-smashed. Helvellyn would be our last climb before Scafell Pike in August so it was kind of important that we set our expectations right by getting in some of the big peaks beforehand. 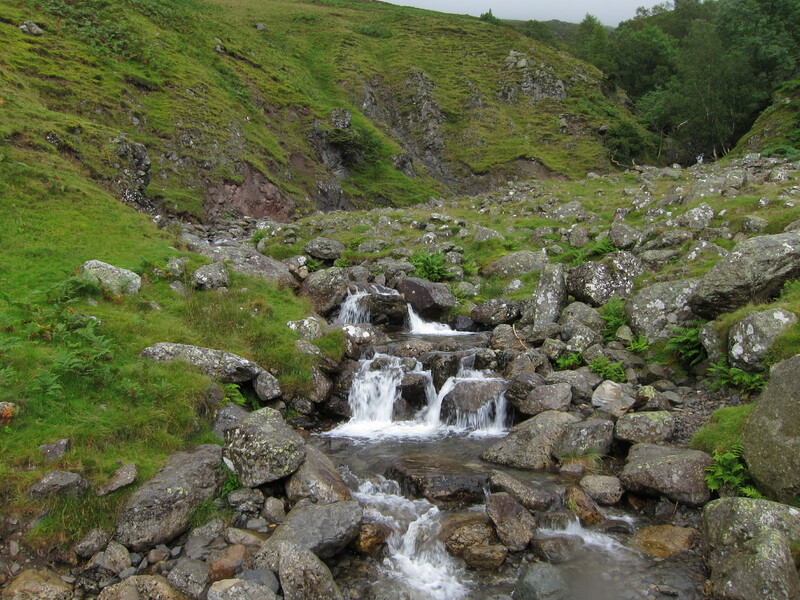 After postponing Helvellyn from its original planned date of 29th July again due to poor weather conditions we figured the next weekend would give us a good spell, but it didn’t! Talking to the SMASH regulars, we all remained uncertain about the chances of getting out at all and were feeling properly down trodden about cancelling another walk. However after keeping a close eye on the forecast there looked like the weather might break just a bit on Monday so on a bit of whim I grabbed the little people and made the journey to Thirlmere. 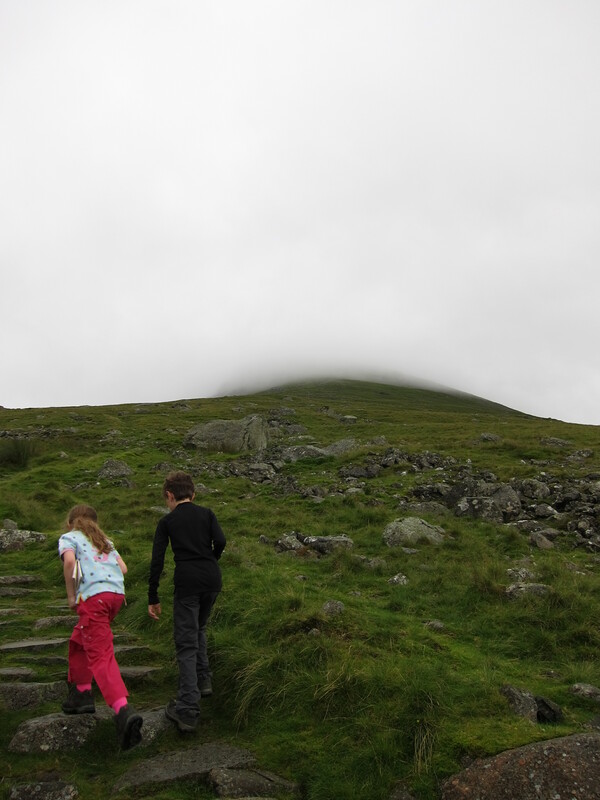 Jack and Emily were less than impressed with the weather but at least the rain was holding off and we set off up the clear stepped path beside Helvellyn Gill. I already knew this walk was going to be less inspiring for them and started a trivia quiz to keep our minds from the task. At this juncture I had my doubts about the weather and set in my mind this was more about just getting outside and seeing if Jack and Em would deal with the conditions. The walk would be straight forward though and had no intentions other than to reach the summit and come back down on the same path. The cloud line was around 500 meters and so we disappeared into the soft white cloud admiring the surreal nature of how new features suddenly appeared from the mist. The quiz went well. Emily thashed Jack and I for not knowing any of her horse based questions which of course remains her specialist subject. I fought fire with fire and hit her with a bunch of questions about mountains and bikes. Jack on the other hand read like a book of general knowledge leaving me wishing I had room in my head for the more fascinating facts of our world rather than passwords and work based garbage that would send a glass eye to sleep. We met no one on the way up. There was a guy on the summit who we spoke to and learned he had ascended from Striding Edge which I thought was brave in these conditions. The four of us all had that look on our faces that said, what are we doing up here? But equally it comes with a wry smile that expresses the inner pride that you bothered to go out at all today and climb over 900 meters to see absolutely nothing at all when you got there apart from each other and a wet trig point. I directed the guy over towards the shelter from the trig where he continued toward Dollywaggon Pike. Jack, Emily and I fumbled about for our lunch bites with wet gloves pulling at draw strings and clips in that panicky shivery style when your eager to get at some food that you know will make you feel normal again.Just then a group of about 6 teenage girls rocked up carrying back packs that looked like they might have more teenage girls inside them. It turned out they were on their third day of a 4 day walk across the lakes and were clearly trying their best to remain upbeat about the journey knowing the weather had been cruel and would remain that way. They took their places on the bi-directional shelter from the wind and had lunch and then they were up, onwards and upwards as they say and they headed toward Whiteside. Are we pleased to be here? 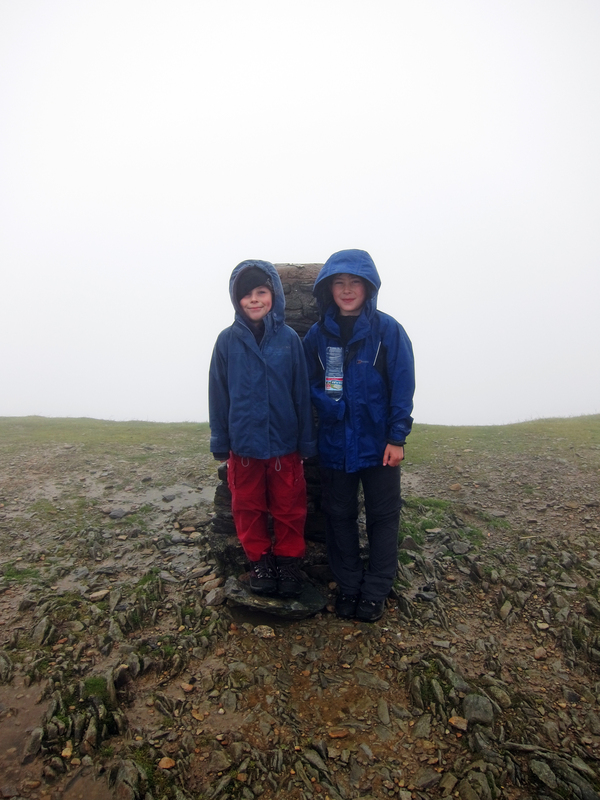 We had our fair and took some very uninspiring snaps if only to prove we were on Helvellyn. There was no view at all and in a way this was kind of amusing to Jack and Emily, they found it bizarre to climb all this way into the cloud and see nothing. How do you deal with that? I guess they could have attacked me and pushed me over the edge. Surprisingly Jack was joking about it remarking that it was typical of me to make them come up here. They were great though and now we had had enough of the wet clouds we wanted to get down quickly and the moment it was suggested Emily visualised herself back in a warm car wearing dry clothes and hugging her favourite cushion for a sleepy ride home. It sounded like a nice idea, so we stepped up the pace. In doing so though Emily took a trip and though I was holding her hand she went down and grazed her leg and to make matters worse I accidentally trod on her arm. She was a bit tearful but her determination to get off this mountain was reignited and she manned up to walk off the beating she had taken. We dropped down below the cloud line and could see the start-finish as others were making their way up. I have to say too many looked less than prepared for what they were planning. One father dressed in black jeans and a t-shirt leading his wife carrying a hand bag and an umberalla, his daughter in similar inapproapriate garb. 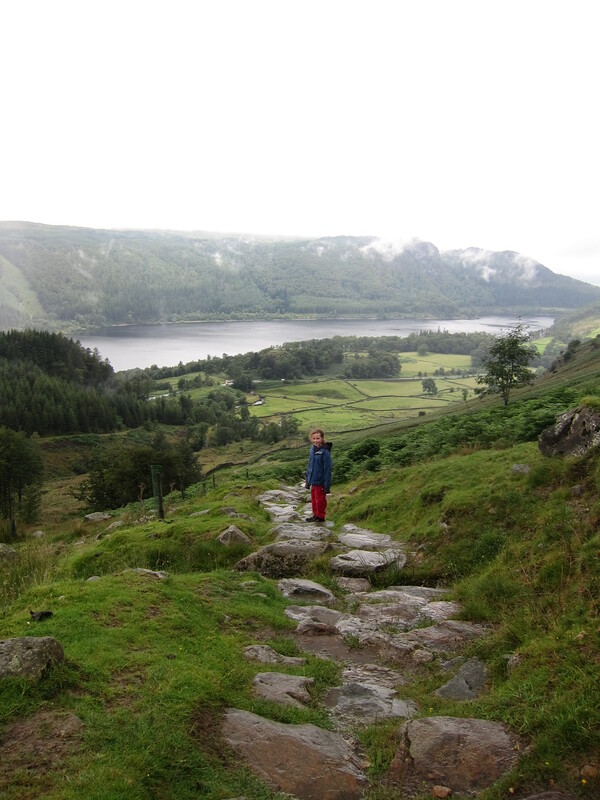 He asked if he was going the right way for Helvellyn. Without being direct or suggesting he wasn’t really equipped for the cold, wet and poor visibilty. He had no map or a shell jacket, I confirmed he was on the trail for Helvellyn but added there was nothing to see thinking it would disuade him from pressing on. I detected a slight gesture of thanks from his daughter. I hope they didn’t continue. 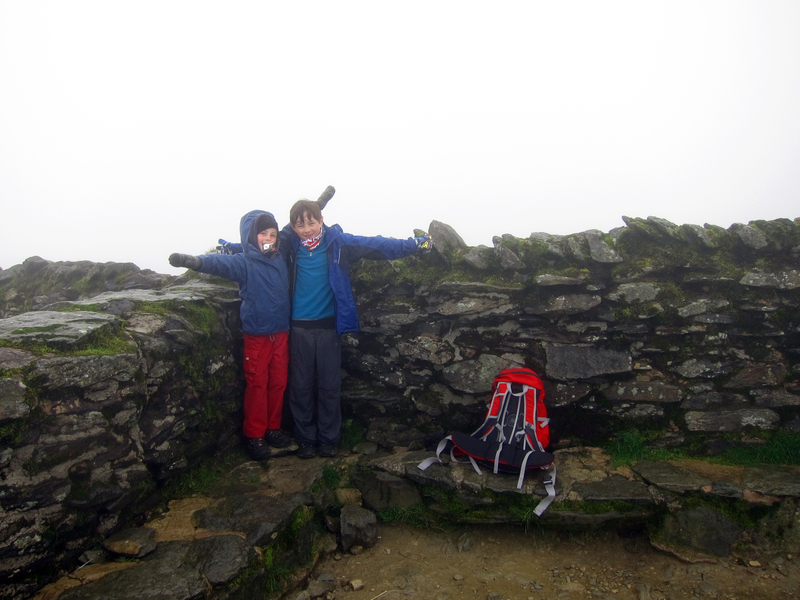 So with Helvellyn SMASHed I was confident that Jack and Emily and myself were better equipped in our minds and physically able to take on Scafell regardless of what the weather could offer in August. So it was a successful walk in as much as it was grim. Were we glad we come out?